Arthur Jackson resumed painting after his retirement in 1987. He executed approximately forty compositions, including the present work, his third composition painted in 1992. 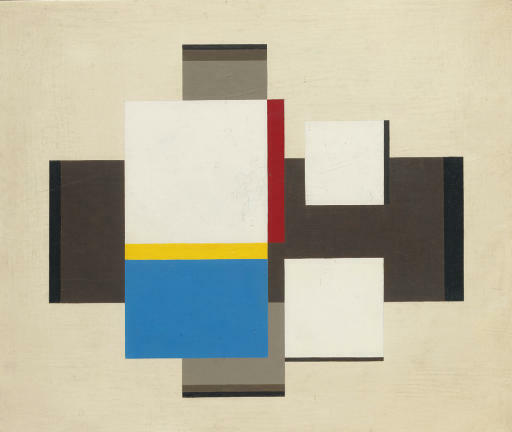 There is a harking back to his work from the early 1930s (many of which were lost during the War) and the influences from his tutor, Ben Nicholson, from that period. There is a youthful exuberance in these later works, particularly in the use of colour, perhaps partly as a result of the break in production. It was almost as if he resumed work regardless of the decades of architecture in-between. Like Nicholson in the 1930s, he was working with colour and rectangular 'L'-shaped forms giving an illusion of shallow space. It has also been observed that Jackson's spatial solutions have similarities with John Piper's contemporary work, who was, at that time, secretary of the 7 & 5 Society. Referring to this, Jackson, in retrospect commented, 'I am not alone in trying to achieve a three dimensional quality in abstraction in which I was varyingly successful' (see letter 18 April 1965, Tate Gallery Report 1964-65, London, 1966).